Llantwit Major/Llanilltud Fawr TownThe compact old town centre is a maze of little lanes, narrow streets, old inns and historic buildings. The more modern Boverton Road area of the town, with a number of other shops, is less than 200m away from the old centre. Also within walking distance is Llantwit Major’s Cwm Colhugh Beach, which has some amazing cliff-top scenery. Llantwit Major is a great place to start or finish a coastal walk on the Wales Coast Path, and is also popular with surfers. Llantwit Majors Historic Past - in around 500AD, St Illtud founded one of Britain's oldest seats of learning in Llantwit Major and some illustrious ‘old boys’ including St. David, the patron saint of Wales and St. Patrick, patron saint of Ireland, were all taught by St. Illtud. He also established a monastery and mission centre and from here the missionaries travelled through the Celtic world spreading Christianity. The imposing church of St Illtud now stands on this site and contains a collection of Celtic crosses and carved stones, many of which are older than the church itself. Other historic sites in the town include Iron Age hill forts, a Roman villa, fine Tudor buildings and a Medieval Grange. During the late 16th and early 17th century, Llantwit Major became a prosperous community. Among the many buildings still to be seen that were built in that period are the Old Swan Inn and the Old White Hart. As you walk around Llantwit Major you can visit 13 historic sites that have been marked with Blue Plaques. Llantwit Major has a railway station on the Vale of Glamorgan line between Barry and Bridgend. The compact old town centre is a maze of little lanes, narrow streets, old inns and historic buildings. The more modern Boverton Road area of the town, with a number of other shops, is less than 200m away from the old centre. 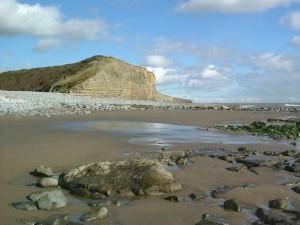 Also within walking distance is Llantwit Major’s Cwm Colhugh Beach, which has some amazing cliff-top scenery.